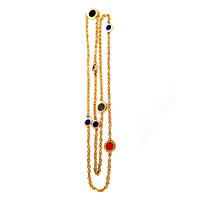 Yellow gold links and precious stones form this daring necklace. Meticulously crafted links are the accessory's base while the designer's name is a prominent feature. Enhancing the piece are onyx, coral and lapis. These stones are displayed within a circle of gold to give the necklace a touch of class and plenty of style.